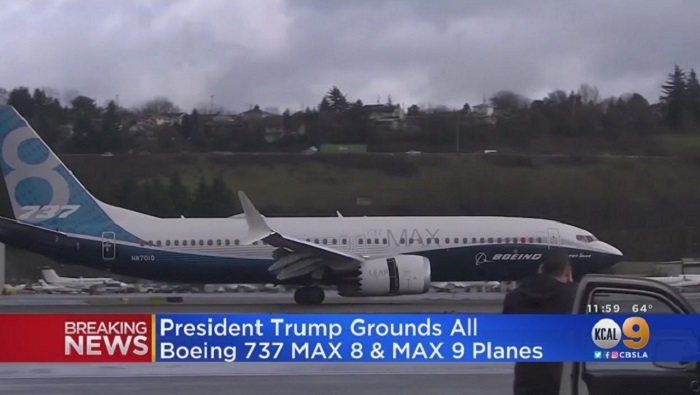 US President Donald Trump on Wednesday announced the immediate grounding of all Boeing 737 MAXs following the second deadly crash of the airliner in less than five months. "The planes are grounded effective immediately," Trump told reporters at the White House, following mounting international and political pressure for the United States to follow the lead of multiple other countries in pulling the best-selling planes from the air. The Federal Aviation Authority (FAA) issued an emergency order shortly after. Those that are currently in mid-flight will be suspended from service as soon as they land, Trump said. Boeing is under heavy scrutiny after the crash of an Ethiopian Airlines Boeing 737 MAX 8 that killed all 157 aboard. The same type of plane belonging to Indonesian Lion Air crashed in October, killing 189. "Hopefully they will come up with an answer but until they do the planes are grounded," Trump said of Boeing. This makes the United States the last major country to pull the jet from service following Sunday's crash in Ethiopia.